The allure of the Annick Goutal house lies in the sheer diversity of genres within its portfolio, from bold Sables to delicate Duel, from vivacious Grand Amour to demure Le Chèvrefeuille, from femme fatale Passion to puerile Petite Cherie… Heure Exquise is one of the most classical compositions from the house, a soft floral orchestration dominated by iris. 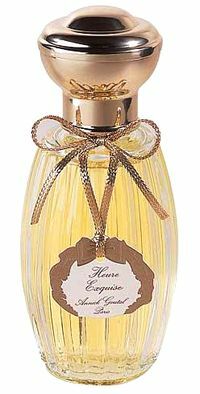 Created by perfumer Henri Sorsana in 1984, with whom Annick Goutal studied perfumery since 1977, Heure Exquise possesses a certain retro glamour. Its name refers to the beautiful and serene moment of twilight, the same moment that inspired Guerlain to name its fragrance L’Heure Bleue. Whether the inspiration had a strong bearing on the final outcome, or whether it is my own projection, but I find that Heure Exquise conveys a quiet, nostalgic beauty. The fragrance structure is similar to Chanel No 19—a floral core, made verdant and sharp with galbanum and rounded out by dark roses. Yet, while No 19 segues into the grapefruit bitterness of vetiver and the dryness of leather—its emphasis is on the leather chypre accord, Heure Exquise’s drydown is deliciously soft. Milky sandalwood, creamy coumarin, and powdery almond notes produce a gentle foil for the cool beauty of the green iris dominated heart. This tender, voluptuous finish endows Heure Exquise with a gilded, Belle Epoque character, whereas No 19 is angular and cool from the first accord to last. I love them both, and I find it difficult to choose a favorite, but without doubt, Heure Exquise is easier to wear and somehow more comforting. I love the way the fragrance envelops me in a cashmere-soft veil, producing a stunning sillage. Heure Exquise includes notes of Turkish rose, galbanum, iris, sandalwood. Available as both EDP and EDT, it can be purchased from retail stores like Nordstrom, Neiman Marcus and Bergdorf Goodman as well as directly from the Annick Goutal online shop. Zazie: So, there it goes: on my to try list! I have not found many loves in the Goutal line: my only full bottle is Ninfeo Mio, though I strongly appreciate Songes and the impeccable Eau d’Hadrien – I think these two triggered my interest in “niche” fragrances, some years ago. Few others however have been so unpleasant for me, that I rarely go merrily testing the line. But your description is so wonderful: it sounds like a light-hearted Chamade. Is that so? A green top over a gorgeous heart? I adore Chamade. It is so special, for me: layered and rich. Heure Exquise could be a (very welcome) more affordable option? Boisdejasmin: Carla, I saw your other comment about dance. I have danced professionally till I was about 20 and now I am still taking classes and doing occasional performances, but it is for myself, rather than for any dance career ambitions. I prefer it this way! Thankfully, NY offers lots of opportunities to dance on any level. Zazie: Ok, my encounter with l’heure exquise was a bit of a disaster – I had a fleeting impression of Chamade follwed by l’Heure Bleue (I do not know n°19 enough for reference), but the Guerlinade was missing, which made a HUGE difference. I also made the mistake to test it with grand amour, which made me totally sick. However, I found an old miniature of Chanel Egoiste, and it was instant love. Lutensian effects coupled with Chanel’s bright luminosity. I don’t think I would have tried it, if it wasn’t for your review. chayaruchama: Heure Exquise is a great love of mine ! I find it warm and dignified, but not old-fashioned. Mimi Walker: I love Heure Exquise so much. It’s elegance reminds me of Parfum d’Hermes, another of my very favorites. It also reminds me of Chanel 19, but the Chanel 19 I remember from years ago. I’ve wondered if 19 has had some reformulation or if my chemistry changed. I still wear it though not as passionately as I once did. Austenfan: Thank you so much for this review. I have been reading your blog for 2 years, and it has often swayed me into buying unsniffed. Heure Exquise is probably my favourite ” female” Goutal ( Songes being a close second), although it is melancholy I find it very comforting and easy to wear. The Chanel is another great favourite, but to me has a totally different vibe. It seems much more formal than the Goutal. BoisdeJasmin: Austenfan, thank you for your comment. You’ve outlined so well the difference between Heure Exquise and No 19. The latter is definitely very formal and cold in comparison to Goutal. Daniel: I love your reviews, they’re enlightening but not baffling for the uninitiated! This is one of my favorites. I love the pretty, unadorned florals blossoming in this garden. It’s not as demanding as N.19(she can be a bit of bristle-y babe) Have you noticed that the similarity to Vol De Nuit’s pillowy drydown? Luna: Exquise is an enchanting perfume – it can be a bit overpowering, but if you know how to apply it, it turns into a transparent aura of grace and fragility. Chanel cools and is cool.